Composite engineering and design involves a mix of engineering, design, process, production and material disciplines. Engineers and designers can often be limited by their experience of composites. Even experts and PHD delegates, in very narrow fields of composites, have found these courses valuable. There are many courses that focus on the mathematics and analysis of composites. The best software is an excellent tool but the information that is generated is only as good as the information put into it. No software will tell you how to design a particular laminate. Our courses are designed to bridge the gap between hands on experience and CAE based design and break down the barriers of communication when it comes to composite engineering and design. To get the best from composite materials, you need to understand how to best use them. Our courses shortcut years of experience and focus on the advantages and limitations of materials, processes, production considerations and controls to form an intuitive and creative approach to composite engineering and design. These courses are widely recognised as intensive and in-depth, covering current composite materials and processes. They provide an honest and open insight into working with composite materials. 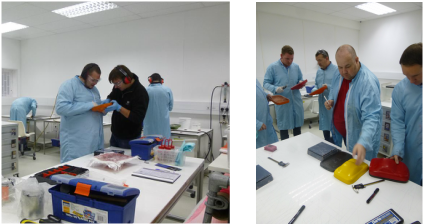 The key focus of this course is for delegates to understand the advantages, as well as limitations and compromises made when using composite materials. The combination of theory and practicals are designed to make delegates think how materials can be best used within a part. This allows delegates to form an intuitive and creative approach to composite engineering. This is now a direct follow on course from our DMSC61 course that addresses the intricate detailing of composite laminates through a structured problem solving approach discussing real problems and possible solutions. This course was originally designed for Vistagy, to support training designers using their FibreSim software to understand how the tools related to composite production. It provides production, engineering, design and CAE personnel with a greater understanding of optimum composite design principles.